If you find yourself wondering if your mood will ever lighten up, don’t be dismayed. There is good reason to wonder. Over the last few months, we’ve had a series of transits emphasizing stagnation, reversal, inward focus, high pressure, and second-guessing ourselves. No wonder, we might find ourselves in the last week of the Cancer lunar cycle* without much in reserve, wondering when life is going to pick up again. Much of the challenge has been due to the retrograde transits of Mars (from March though May), Mercury (in June), and Saturn (from March till this week). All this backward motion has backed us up. The Mars retrograde has especially contributed to a pervasive need to wait before acting, and second-guessing the actions we did take. Although Mars turned direct in May, hesitation has lingered due to the nature of Libra, the sign of Mars’ retrograde journey. Mars likes direct action and has been uncomfortable during this extended stay in the balancing sign of Libra. This week, Mars finally moves out of the retrograde zone from Libra into Scorpio where Mars’ passionate and instinctual nature is much better supported. The grand cardinal cross of April—involving Mars, Uranus, Pluto and Jupiter—added a lot of pressure, which lingered through this Cancer cycle. In some places the pressure got to be too much, causing explosions of all kinds. Just look at Ukraine or Gaza for evidence. In other places, the pressurized stagnation has felt uncomfortable and uncertain as we were left wondering when the lid would blow for the rest of us. This cardinal cross pattern is breaking apart as Pluto and Uranus find their greatest separation for now and Jupiter moves out of Cancer into Leo. This will shift the energy noticeably. The New Moon in Leo on July 26 will be a welcomed change in how we meet our challenges. Saturn in Scorpio (fixed water sign) is not exactly an extraverted signature as it is, but as Saturn has been retrograding through this deep and introspective sign, we’ve taken things even more seriously. Scorpio touches on the places we try to hide even from our selves. Saturn has provided fuel for brooding, but this isn’t the only influence on darker emotions. There’s been a grand water trine in the sky recently that has contributed to feeling mired in a downward spiral. After all, that’s how water flows. Water’s healing force is rooted in emotional wisdom. Sometimes this means allowing all of our feelings to arise and fall away again. In my experience this Cancer lunar cycle, although at times overwhelming, has been an opportunity to make a home for more of my emotions. And I feel it is necessary to be clear. Sometimes we need extra help to get out of stuck emotional states like depression. This help comes in many forms, including medication and therapy. Asking for and getting help is an important way of making a home for our emotions, keeping ourselves safe. Isn’t this the purpose of a home? Sunday, July 20. Thud! That’s sound of hitting bottom. Saturn stations direct today and slowly we begin to climb out of a ponderous period of introspection. Saturn’s discomfort holds a hidden gift—our own authority. Since March, Saturn has moved backwards through a portion of Scorpio. The authority we get to claim now is through a commitment to self-honesty. We don’t have to be perfect. What kind of power does that give you? Uranus stations retrograde tomorrow. The planet of freedom and authenticity is quincunx to stationary Saturn. How are you feeling the stretch between freedom and obligation? What happens when you are completely honest with yourself about both? Monday, July 21. This is a very zippy day. Because Uranus stations retrograde today this planet is stronger, potentially causing disruption and chaos, especially in the areas of our lives that need awakening. The Moon in Gemini adds to the tone of changeability. Due to the speedy nature of these influences we can get ahead of ourselves. So, be careful and notice when you want to do too many things at once. Another influence: Mars leaves behind the zone of retrograde motion that it entered in December. Whew. If you are longing for more speed, then watch out, you will get your wish soon. Late in the day, you may feel a strong desire to get something off your chest. The opposition between Mercury and Pluto may reveal hidden power differentials. July 22—Balsamic Moon: Surrendering. Sun enters Leo. “Do I stay or do I go?” Quiet introspection is supported by the last few days of the waning Cancer Moon cycle. But with the Sun entering Leo, we may want to jump ahead of ourselves into the expansive fun of the Leo season. Paradox is great, isn’t it? Especially when we are aware of why we want two seemingly opposing things. To honor your soul—the home of your true self—stay tuned to emotional insight. To honor your gifts to the world, begin to nurture the fire of creative expression. If you aren’t quite ready to jump onto the stage of life, that is OK. Tendrils of sensitivity still lurk. It is appropriate to be unsure of your direction right now. Wait till the New Moon in Leo on July 26 to set new intentions using the emotional wisdom you’ve gained in recent months as a starting point for what you will do next. The Moon in Gemini makes a favorable connection to Uranus. Activities that support ingenuity, learning, and doing something new are supported. Most likely we will feel more of the old Moon energy of this lunar cycle tomorrow night (CDT) when the Moon enters Cancer. Wednesday, July 23. Most of the day the Moon is in Gemini. Be curious. Notice how the mutable air Moon colors this day for you. Remember that mutable signs are seeking to integrate, learn, and connect. Our feelers extend to pick up on the atmospheric information all around. How are you extending your feelers? Does this feel exciting or over stimulating? The questioning and curious Moon trines Mars in Libra this evening (CDT). How does the passion of Mars increase your desire to know? Thursday, July 24. The next two days are loaded with transits, and with the Moon returning to Cancer at the end of this lunar cycle, we may find ourselves brooding again on feelings. What have you learned about the importance of making a home for your true self? Metaphor is strengthened when we match it with concrete action. How have you made a real home for your true self? This solid base helps us move through big energies today. Where to start? How about with the transits supporting our watery natures? Another grand water trine forms with Mercury in Cancer, Saturn in Scorpio, and Chiron in Pisces. Are you feeling stuck or heavier than usual? Take the Mercury challenge to express through words what you are feeling. In addition, Venus in Cancer trines Neptune in Pisces. This transit supports finding that cozy spot where your heart can tenderly reach out to the world. We are more sensitive to collective pain, but also to collective compassion. On the more energetic front, the Sun in Leo joins Jupiter in Leo. Self-love is the beginning of generosity. This expansive energy contributes to a strong push for change from the Mercury square Uranus transit that also happens today. Friday, July 25. What could you expect from the very last day of the Cancer lunar cycle? Perhaps a need to be alone? Or to spend quality time with beloveds? Do you need to give yourself a some tender love? Are you spent with taking care of others? Cancer is linked to the tides. At high tide, we feel enormously confident that we can create the nurturing environment that is needed. At low tide, we need to restore that capability. If you are at low tide, remember you can nurture yourself too. The grand water trine of Mercury, Saturn, and Chiron takes us to the water once again. Mars enters Scorpio (fixed water) this evening (CDT). This hero of the internal places in our hearts is a champion for staying true to what we need in this moment. 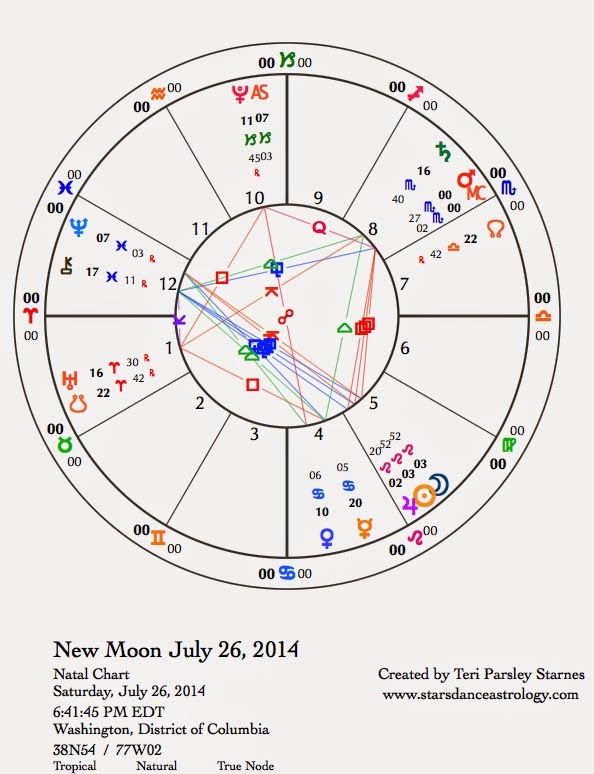 July 26—New Moon: Beginning. This New Moon in Leo comes along right after Jupiter’s ingress into Leo for a year. The Sun and Moon conjunction is just one degree past Jupiter in the chart for the New Moon. The beginning of this lunar cycle is infused with the influences of this newly-initiated Jupiter journey through the sign of solar radiance. Lion-hearted Leo represents the ways we shine, wish to shine, and support each other’s shining. Each one of us has a Sun in our birth charts—the center of our personal constellations. Together we are a collection of Suns in a solar system of the one Sun. The sign of Leo reminds us that each of us emanates light from an essential Self. This light is life force. In the previous Cancer lunar cycle, the Moon helped us deepen into the fertile darkness of emotion. From that foundation, we expand outward into what the Sun gives us—light and life. Mars in Scorpio squares the trio of the Sun, Moon and Jupiter in Leo. What are you fighting for right now? Is it to be seen, to be felt, to know that you matter? Are you fighting for life? The complex relationship between Scorpio and Leo provides a challenge, how hard will you fight for your essential life force? The easy reaction is to let this passion erupt as anger. To move deeper past anger you may want to ask yourself, What is my essential self and how will I serve this radiance? Scorpio’s challenge is to dare to look under the surface to discover what is really driving us. This is a powerful way to see the light that radiates from each of us.